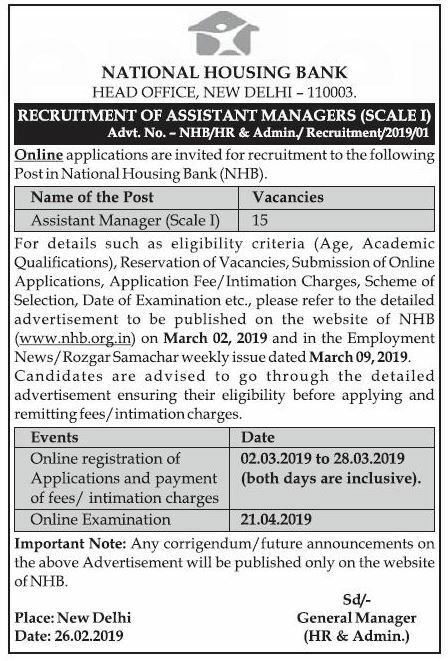 Bank Jobs 2019: Bank Job Alerts!! If you among the candidate who is in search of Bank Jobs in India either it is Private or Government Job, Then you have reached the perfect destination. Most of the graduate’s aim is to grab the jobs in the Banking sector. Because it is one of the fastest growing sectors in India. This is the web land, Where the applicant can find all the Private or Government Bank Job Notification along with Eligibility criteria under one roof. Hence, We advise the applicant to scroll down this page to get aware of Latest & Upcoming Bank Jobs. As this is the fastest growing sector, It also needs huge manpower. Every year lot many bank Job notifications has been releasing by the Indian Government. If the graduates want well paid & secured job to satisfy all his needs, Then Bank Jobs are the perfect match for them. This is the sector where the applicant can get enhance his career both the sides Personally as well as Professionally. As per the recent survey, The government banks are recruiting more than 1,00,000 candidates for various roles in the banking Industry. As we know getting jobs in the Government sector is very prestigious for us. And why not it is a Bank Job. An individual can find more details about the latest Govt Jobs in India on this page. We people from Isarkariresults.com has taken you to the Latest & Upcoming Bank Jobs on this page. At this web page, an individual can get all the latest updates of bank notification for fresher’s and Experienced candidates on a daily basis. In recent days, many Banks like State Bank of India, Reserve Bank of India, Bank of Baroda, Bank of India & others released various vacancies to fill multiple posts across India. Not only this, many other banks are releasing notifications to fill various profile. Here Applicant can find the latest bank job notifications frequently as released by the particular board. Getting a government job like Bank Jobs is not everyone’s cup of Coffee. For that candidates need to be aware of all the latest notifications released by various banks. Hence, We advised to the candidates to make use of this article and be aware of all the latest job notifications released by top Banks in India. Why Bank Jobs? Why not others? Here are some of the factors influencing the candidates to build their career in Banking Sector. Bank Jobs are more secured unless one can do a fraudulent mistake. This is why many aspirants looking forward to Bank Jobs in India. As ours is a developing country, the growth of the population is increasing day by day while another side the usage of banks also getting an increase. So, The Banking industry needs more youngsters to take up this industry to the top level. In realistic, 50% of the employee in banks are middle age group. This is the time in all the bank’s retirement are happening at a rapid pace. In order to fill up these vacancies, almost 1,00,000 new jobs are expected to fill by this end of the year. An entry-level Probation officer in Bank is getting 4 lacs per annum. By this, one can understand the pay structure for others. For the same post applicant is getting slightly higher in SBI. Apart from this, there are many other factors like Career enhancement, Holidays, Developing Skills, Interest is influencing the candidates to show interest in bank Jobs. Get upcoming Jobs from the banking sectors here. The reputed banking or Financial sectors like SBI, ICICI, Canara Bank, Vijaya Bank, PNB, Union Bank of India & other bank are on board to recruit a candidate for various vacancies like Probation Officer, Manager, Clerk & other vacancies. On this page, we are updating Upcoming Bank Jobs from the Govt and Private sectors as well. Hence, Check out complete details of the Upcoming Bank Recruitment details here. From the above-given information, one can understand the importance of Bank Jobs. Our site Isarakariresults.com has been updating the latest & Upcoming Bank Jobs across India. So, Make use of this opportunity and apply online for various posts in Bank Jobs 2018. Hence, applicants are advised to be in touch with us to get updated with all the latest bank notifications.